Returning America to the Promised Land of the Bill Clinton economy, those halcyon days of the 1990s, is the latest political carrot from Democratic frontrunner Hillary Clinton. On May 16, she said this in a campaign speech in Kentucky: "My husband, who I'm going to put in charge of revitalizing the economy, because you know he knows how to do it." The raging success of the "Clintonomics" has become a touchstone not just for Hillary, but for many Democratic candidates. It's held up as "proof" that economic policies favored by liberals work. This makes for great speeches on the campaign trail, but it strikes a false note. You see, the miracle of the Bill Clinton economy is a myth. But more than that, several of President Bill Clinton's policies opened the door to the Wall Street excesses that gave us both the dot-com crash of 2000 as well as the financial crisis of 2008. Nearly 21 million jobs were created. Unemployment dropped to under 4%. The Dow Jones Industrial Average soared more than 220%. Gross domestic product (GDP) growth averaged 3.8% a year (it was 2.4% in 2015). Inflation was a moderate 2.5%. 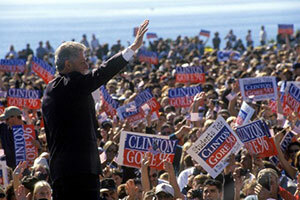 Well, for starters, good fortune played a big role in the Bill Clinton economic boom. For example, the Internet started to take off in the mid-1990s and quickly became a massive economic stimulant. Unless you credit then-Vice President Al Gore with inventing the Internet, the Clinton Administration had nothing to do with this key factor in the booming 1990s economy. President Clinton also enjoyed the benefits of greatly reduced defense spending in the aftermath of the collapse of the Soviet Union in 1991. That played a role in the balanced federal budgets of his second term. Low oil prices also helped stimulate the economy. Crude oil prices stayed below $20 for most of President Clinton's two terms. These unusual advantages amplified the impact of Bill Clinton's economic policies, making them appear far more successful than they otherwise would have been. One catalyst for the late 1990s economy was a 1997 tax cut signed into law by President Bill Clinton but pushed through by the Republican-controlled Congress. So President Clinton gets half credit for that. Perhaps the best-known of these is Clinton's 1999 repeal of the Glass-Steagall Act of 1933. Glass-Steagall regulations prevented commercial banks from having an investment business. In 1956, the act was amended to create an additional regulatory wall between the banking and insurance businesses. The dismantling of numerous regulatory firewalls took the shackles off the nascent derivatives markets. This change allowed banks to make very risky bets with borrowed money. It's the genesis of such monsters as credit default swaps and collateralized debt obligations (CDOs) at the heart of the 2008 financial crisis. The CDOs are where the debt from the subprime mortgages started to accumulate. These "mortgage-backed securities" tanked in value when the housing bubble burst. But in the late 1990s, such exotic financial instruments helped fuel Wall Street profits. Making this situation worse was President Clinton's decision to relax "selective credit controls," regulations that discouraged lending to homebuyers with poor credit. This trend actually started as far back as the Carter administration and continued through the Reagan administration, but accelerated under President Clinton. It was done with the goal of increasing home ownership, which in turn would boost the economy. But predatory lenders and big banks exploited the situation. The subprime loan market, worth $90 billion in 1995, doubled within three years. Fed by greed and enabled by President Clinton's weakened regulations, the subprime mortgage cancer kept growing until it blew up in 2007. Bill Clinton shares the blame here with President Ronald Reagan, who first appointed Greenspan as Fed chairman in 1987, and George H.W. Bush, who reappointed him. When it was his turn, President Clinton also reappointed Greenspan (as did President George W. Bush after him). Despite his golden reputation, Greenspan's actions, particularly during the Clinton years, were catastrophic in the long run. Through most of the 1990s, Greenspan kept interest rates relatively low, encouraging more and more borrowing. The reason, according to former Director of the Office of Management and Budget (OMB) David Stockman, was an attempt to offset the impact of cheap Chinese goods made with cheap Chinese labor. Greenspan's easy money, combined with President Clinton's free trade policies "resulted in the hollowing out of the American economy because it prevented American capitalism from adjusting to the tsunami of cheap manufactures coming out of China and its East Asian supply chain," Stockman wrote in a recent blog post. Cheap money flooded the U.S. economy, and credit market debt outstanding soared from $15.8 trillion in 1992 to $28.6 trillion in 2000. Greenspan's policies provided the fuel that powered the out-of-control stock market rise in the late 1990s that is considered one of President Clinton's achievements, even though it ended in a painful crash. "Greenspan's purported monetary magic actually stole from the future — and massively so — in order to pump-up the 1990s," Stockman says. So it turns out the Bill Clinton economic miracle was built on sand. At this point, the U.S. economy is still reeling from the damage inflicted on it 20 years ago. Not only would it be a bad idea to attempt to duplicate this "boom" now – it's no longer even possible. The Bottom Line: Hillary Clinton is promising to put former President Bill Clinton in charge of the economy should she win the White House. But the Bill Clinton economic boom of the late 1990s isn't what it seems. It borrowed prosperity from the future while sowing the seeds of two stock market crashes in the years following his administration.